Red and white tile, slanted roof, arched sign…looks kind of familiar. Opened in September 1954, this stand at 1057 E. Mission Blvd. in Pomona was one of the earliest McDonald’s, back when they were still franchised by brothers Richard and Maurice McDonald of San Bernardino. The first McDonald’s opened in 1948 in San Bernardino, after their 1940 carhop stand was converted into a drive-up. After that, McDonald’s No. 1, subsequent restaurants were opened in this order in 1953 and 1954, according to Hess’ book: 2) Phoenix, Ariz., 3) Downey, 4) North Hollywood, 5) Alhambra, 6) Sacramento, 7) Azusa and 8) Pomona. Some sources reverse Azusa and Pomona; both opened in September 1954. My information from a decade ago, which I believe came from pop culture scholar Chris Nichols, is that Pomona’s opened Sept. 1. Unless Azusa’s opened the same day, it’s likely Pomona’s is No. 7, not 8. Whichever, it’s still old, and unlike Azusa’s, it’s still standing. Downey’s is the oldest surviving example and operates as a McDonald’s. Pomona’s is the second-oldest. Third-oldest is at 1900 S. Central Ave. in L.A. and can be seen from the Blue Line just south of downtown; it’s a Mexican restaurant and looks less like a McDonald’s now after alterations a year or two ago. 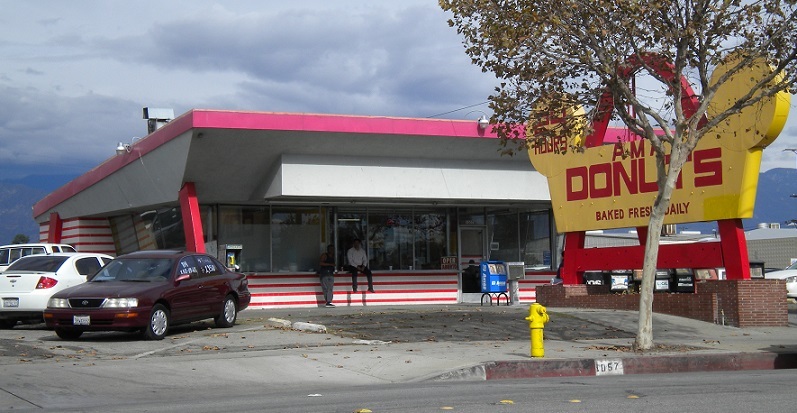 Thus, Pomona’s building may be the best-preserved original McDonald’s other than Downey’s. Perhaps someday, Pomona’s will get the Downey treatment. This entry was posted in Mod! by David Allen. Bookmark the permalink. True. The Airdrome and their San Berdoo carhop stand might be considered false starts or warmups. Is that a guy sitting on the ordering window>? Not Cool! I think he saw me snapping this photo across the street. Before the next frame, he climbed down. Do you have a list of other early (pre Ray Kroc buyout 1961) franchises? Which number is the 1900 S. Central, LA franchise? Thanks for this great info! After No. 8, I don’t know the order. The L.A. location you refer to opened three years after that, in 1957, according to this account by Chris Nichols — http://www.lamag.com/askchris/historic-architectural-culinary-landmarks-along-route-ciclavia/. It’s visible from the Blue Line and still looks a bit like an early McDonald’s, although not as much as it did until a remodeling about five years ago. Thanks David! I wonder if they didn’t consider the San Fernando Valley “LA” since Chris says that the the one at 1900 S. Central was L.A. resident’s first McD’s, but the one in NoHo at 12919 Victory Blvd opened in 1954? I’m so curious about the first 25 or so McDonald’s that were built! Thanks again! just saw the movie The Founder. they mention the Sacramento location and was wondering if information is available to know where the location was in Sacramento. According to Google Maps, the current McDonalds is at the same location as the original (5425 Fruitridge). All odd number addresses on that street are on the north side, as is the current McDonald’s. It was McDonald’s #6 (the firth franchise by the McDondalds – pre Kroc). My father worked there in 1954.